Contact Upton Engineering Pty Ltd.
Upton Engineering is a household name throughout the irrigation industry with several thousand UPTON machines at work in all parts of Australia and overseas. Upton has constantly met Australian farmers' needs for solid, reliable water handling equipment and has recently expanded into trenching and pipeline installations to cover products such as flanged galvanised fittings, custom built diesel pumping units and bore hole pumps. 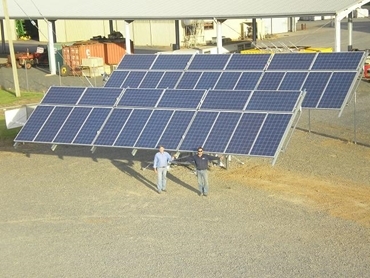 Upton currently offers as well the Australian Made Dual Axis Solar Trackers. Designed to suit many applications, these solar trackers are fixed to roof mount kits in a range of sizes to suit all roof styles to take full advantage of generous government grid feed in tariffs. By pointing directly to the sun at all times, solar trackers will allow customers to get the most output from their panels. Designed and built using the latest in CAD/CAM technology, these unique trackers, are patent pending in Australia, USA and and Europe.